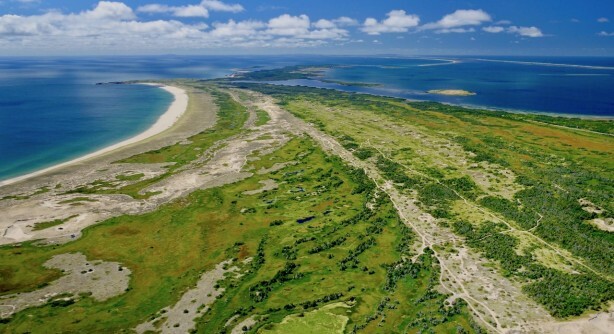 Between the beach and the center of Les Îles, there are many types of environments: dunes, peat bogs, salt meadows and marshes, lagoons and forest. The flora which is most characteristic of the archipelago is found in the sand dunes which make up 30 % of the total land area in Les Îles de la Madeleine. Dunes are covered with beach grass (short-liguled ammophila) that plays an essential role in sand dune stabilization. Its rhizomes (underground stems) trap the sand in the dunes, preventing it from invading and filling up habitats located behind the dunes such as lagoons and ponds. Other plants also grow in the dunes: sea beach sandwort, beach pea, sea rocket, black crowberry, starflower, not to mention the magnificent poverty grass, one of the rarest plants in Québec. In salt meadows and marshes, there are many species of gramineae (grasses) such as carex (sedge grass), bulrushes and spartina. Other species such as Baltic rush, black sandwort, glasswort, marsh rosemary are also present. In peat bogs, ponds and freshwater marshes, you will see sphagnum moss; a plant whose stems grow upward year after year, while the base decomposes slowly, creating the peat bog. Peat bogs are a perfect environment for our two carnivorous plants: the pitcher plant and the dew plant (round-leaved sundew), as well as the grass-pink orchid and the hare's tail (tufted bog-cotton, Eriophorum vaginatum). Dense colonies of gorgeous blue flag grow in freshwater marshes, as do the buckbean (marsh trefoil), the giant bur reed, the marsh cinquefoil and the sheep laurel (dwarf laurel, lambkill Kalmia). The forested area is not large, but it does offer many interesting plants. Of course, there are berries: bunchberry (Cornus canadensis), rose twisted-stalk (Streptopus roseus), fetid currant (skunk currant, Ribes glandulosum), raspberries. Other plants also flourish in this environment: Labrador tea (Ledum groenlandicum), stemless (common) lady's slipper (Cypripedum acaule), yellow clintonia (Clintonia borealis), wild lily-of-the-valley (mayflower), twinflower (Linnaea borealils) and Indian pipe (Monotropa uniflora). In summer, fields, meadows, even the roadsides are ablaze with wildflowers of all kinds: you can expect to see the following plants: ox-eye daisy (Chrysanthemum leucanthemum), buttercup (Ranunculus acris), red clover (Trifolium pratense), white clover (Trifolium repens), alsike clover (Trifolium hybridum), rabbit-foot clover (Trifolium arvense, bird vetch (Canada pea, Vicia cracca), yellow melilot (Melolotus officinalis), Canada goldenrod (Solidago Canadensis), pearly everlasting (Anaphalis margaritacea), fireweed (Epilobium angustifolium), foxtail barley (Hordeum jubatum). Did you know that wild berries can be found all over the Islands? - Wild strawberries: Last two weeks in July, in fields and at the edge of forests. - Raspberries: End of July and beginning of August, in clearings and in wooded areas. - Blueberries: August, on the dunes and in the woods. - Cranberries: End of September, on the dunes, at the edges of ponds and in damp fields. If you want to explore these areas for botanical purposes, it helps to have some training or the services of a knowledgeable guide. On the other hand, a book like Plantes Sauvages du bord de la mer from the Groupe Fleurbec, can be of great help.